Note: I originally published this post in April, but my friends and I have tweaked the bread recipe since then, so I’m making the changes and bumping it up for the rest of you to see. It’s been nearly a year since I was diagnosed with serious food allergies, which was followed pretty closely by me being diagnosed with atypical celiac disease. (A set of food allergies often indicates a further gastrointestinal issue at the heart of the allergies.) For nearly a year, I’ve gone without really good bread–and for the most part, I’ve adjusted. Before my diagnoses, I had already cut back the number of starches I consume, limiting my starch preparation to one kind per meal in the process of taking care of myself. After all, I figured, do I really need bread and potatoes, or cornbread and rice, at the same meal? Unlikely–the calories usually stack up way past the nutrients when starches are doubled. After my diagnoses, for most of my meals, I’ve either used an alternate starch or just skipped the starch—and will continue to do so. But there’s something about bread, right? And I’ve missed that something. So when I came across a gluten-free, soy-free, egg-free, dairy-free (vegan) bread recipe reputed to be great for sandwiches, I had to give it a try. My hopes were not too high, because I have altered and tried several well-reviewed gluten-free bread recipes that have not turned out so well. 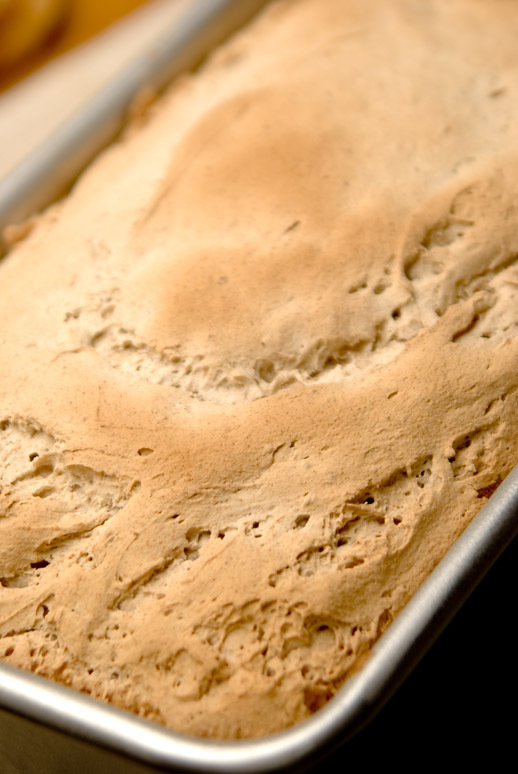 It’s hard to make good bread when you’re cutting out the soy, dairy, and eggs in addition to the gluten, because those other ingredients are often used to prop up what breads are lacking from the gluten. But this one I could make purely as it was written, and that excited me. Mixing the various flours for the bread, I relished the experience. I thought, Even if the bread doesn’t come out right (and it probably won’t), this is fun. It was a bit like playing in the mud or in some rain puddles as a child. Some of the very starchy, light flours I was using puffed clouds into the air as I measured them out. As I continued to measure and combine flours, I looked down to realize I was covered in smears and streaks of the various flours. A friend arrived at my apartment, and she laughed at my powdery coating. “Why didn’t you wear an apron?” I just shrugged and grinned. Once I had combined the flours, the bread came together very quickly in the mixer–but not without me managing to splatter my bluejeans with dough (I do not claim physical grace as one of my virtues). The bread rose on top of the warm oven and then baked inside it. Another friend, upon arrival, sighed in pleasure as the heavenly scent of baking bread reached her nose. “It’s real bread,” she replied with a teary smile, and asked for another slice. We sat down to dinner–two gluten-avoiders, two gluten-eaters–and together, we demolished a loaf over the course of the meal. Note: If you are using a mixer that doesn’t have a great engine, you may want to mix it by hand at the end to ensure it’s all mixed. Since there’s no gluten to get tough from overmixing, you can mix until you’re confident. Mix with electric mixer–using paddle attachment, NOT regular beaters or bread hook–for two minutes. The bread dough will be more like cake batter than traditional bread dough. For the best rising: While mixing the bread, create a proofing box from your microwave. Microwave a small mug or ramekin with water until the water boils. Leave the water in the microwave. Pour the bread dough into two nonstick or well-greased pans. Tuck the loaves into the microwave with the water—the container of water should not be touching the pans. (I have to remove the turntable in my microwave to do this.) Allow to rise until batter extends a bit over the top of the pans–generally 30-50 minutes. As with most breads, it is easiest to slice if you allow it to fully cool. But who can wait that long? I usually let it cool for a little bit, and then remove the loaves from the pans and place them on a rack to cool more while I slice it up. The bread tastes delicious warm, dipped in olive oil and herbs or spread with honey and ghee. It also works well for sandwiches after it has cooled. If you won’t be eating it within 2 days, after it’s cooled, slice it, wrap it in a couple of layers of plastic wrap, and freeze it. Never refrigerate this or other bread—it will get dry and hard if you do. If you leave the bread on the counter (wrapped), it will be good for all purposes for a couple of days. After that, it will be best used for bread pudding, French toast, croutons, etc. Note on recipe alterations: It’s been several years now since I published this recipe, and there are over 250 comments on it at this point. If you need to make alterations to the recipe, you will probably find an example of where someone has successfully changed the recipe to suit your needs if you take the time to read the comments. I’m no longer replying with suggestions when people need alterations, because there are so many options already included in the comments. Also, though you may be able to reduce it or change the kind you use, some form of actual sugar (fructose, glucose, sucrose) is essential in this recipe, because the yeast consume it and release carbon dioxide as a result, and that’s what makes the bread rise. 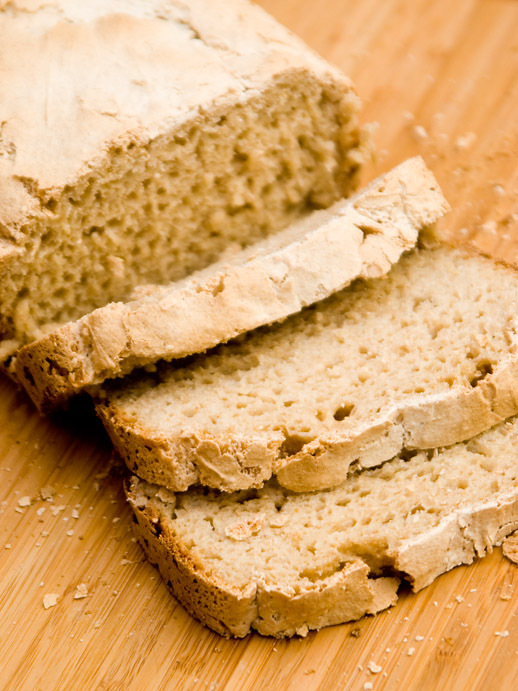 If you cannot eat yeast, I would suggest looking for quick bread or soda bread recipes, but yeast is essential for traditional sandwich bread texture. I am sensitive to potatoe also. What could I substitute for the potatoe starch? thank you so much for this recipe. it’s great please send me some more of your great recipes i have so many allergies i find it hard to eat and react like crazy. it’s nice to finally find somethings thats not only good for me but i feel good when i eat it. Sally, I’m in tears! My daughter was diagnosed with severe food allergies at age 2 1/2. She is now 5 1/2 and we haven’t been able to find a bread that she feels happy about. I can not wait to try this and tell her about it! Birthdays have been very difficult and so have breakfast time. She can’t have Gluten, Dairy, Egg, or Soy, but she is also sensitive to baker’s yeast, potatoe and we were told that she could really only do corn and rice as far as grains were concerned. I’m thrilled to have come across your blog, simply from google! 🙂 Thank you!! Also, I can’t wait to make this bread and will try some of the substitutions listed by others, then I will re-post later after our experience 🙂 *Cheers! It’s in the micro proofing as I write. Can’t wait. New to wheat free and fingers crossed! Will update as soon as I try it! I love people who share their knowledge with others. I have suffered with extreme abdominal pain day and night for three years. Life as I know it is no longer. Just two days ago the results of my expanded GI panel test were returned. I was told I have a load of yeast, strep bacteria, kinsella pneumonae, e coli and that I’m senstive to soy, albumin in egg, gliandin and casien. I’ve spent three years non-stop researching, paid so many people private docs, holistic practitioners and have have all the tests under the NHS but all to no avail. The only person whom has come close to helping is Jim Thorp CHECK practitioner based in Sutton Coldfield Birmingham UK. I have the most massive file of research you could imagine. I have felt overwhelmed with the latest findings and with years of false hope perhaps I’m closer to getting my beautiful life back. I have all kinds of symptoms and it seems that I also have contracted muscle issues on the right side of my body too which causes intense pain but the worst of it all is the abdominal pain that keeps me up day and night and I can’t eat. Anyhow, I’m probably boring everyone now but after all the latest findings I have collated all the information in a document including what I can and can’t eat. Basically I have had issues for years already and am underweight and perpetually hungry and tired. So today I have been looking at how on earth I will replace certain foods. This recipe for bread sounds wonderful so thank you so much. I have tried gluten free only before and tried things from the super market but they were horrible and also did not reslove my issues, probably because I didn’t know that soy, egg and milk were also a no go for me. I also found out that for coeliac’s the NHS will provide some staple food on prescription. I have to ask my GP but as I am sensitive and the tests are private maybe they won’t help me. I read some reviews that there is one fresh bread available on NHS made by Juvela and it tastes just like bread. I hope I can get some. Reading through your stories has made me cry and I was already overwhelmed with lack of sleep, food and overload of info I’m processing. Still, I have hope that I may get my life back, so thank you so much for the recipe and the comments by others. It’s mad when you feel all alone in your quest to get better and pain free but it is reassuring when one finds others coping with their conditions. God bless you all with good health, love and happiness. I can’t wait to bake this bread. I have several of the flours, but I have to buy some others. I am excited to have a replacement for corn and soy (in addition to wheat and dairy). I am going to experiment with the sugar. That’s another my son tests positive for intolerance. The dairy free if “my” big challenge… but corn is proving equally difficult to avoid. Thanks for the blog. Just made this recipe in my bread machine. The top looked lumpy, but my husband said it was the best bread ever, and went on to eat almost half the loaf. What can be substituted for corn and potato starch? I am celiac, and have food intolerances that vary in severity. I have recently discovered that soy is another culprit in my diet. Now, I’m not one that eats a lot of bread as my husband is Vietnamese and we mainly eat rice. As I have been researching to find other food options, I came across this site. I gave up on bread years ago (about 3) when I had decided I’d wasted too much money on trials that tasted like sand. So, THANK YOU!!!! Thanks for giving me HOPE that edible bread is possible. THANKS!! Where is this bread recipe? Searching…..
Scroll up, Lynne. It’s in the post. . . . I was recently diagnosed with EoE and a wheat (as well as poultry allergy on top of my known lifelong egg allergy). I stopped eating wheat and my heartburn an acid reflux stopped i eat a granola bar and my throat constricts and i have terrible heart burn. Ive always baked my own bread in a breadman bread machine very successfully. Wheat free baking scares me! Ive been playing with this recipe and had two pretty big fails before a decent loaf (holds together, isn’t dry, tastes great!). My modifications are as follows: half the recipe, use flaxseed instead of xanthum gum, 1/2 tsp baking soda, 1/2 teaspoon apple cider vinegar, 1 tsp vanilla extract, no corn starch because I dont have it so double the potato, added a handful of oats (wheat free oats), 2tsp of active dry yeast instead of 1 tbsp. I purchased all the flours in “bulk” on amazon prime. Thank youso much for posting this! Life seemed bleak without wheat but not anymore. Just one thing – xanthan gum is made from maize and reacts in me as maize does ie leaves fuzzy brain. Guar gum has no effect on me whatsoever and seems to have exactly the same effect as xanthan gum. Someone asked for the nutritional information. I figured it out. My per-slice information is based on 20 slices per loaf, but I’ll also give you the per-loaf information in case anyone cuts their bread thinner or thicker, then they can figure it out themselves. **What can I substitute for potato starch? Does anyone know the answer to this??? Thanks to all who share what they learn to make the path for the rest of us a little easier! My first tries resulted in bread which sank in the middle. I did a little research, and switched to xanthan gum from the guar gum I had been using. Apparently xanthan gum is preferable for yeast baking. With this change, my bread comes out beautifully. I have a son allergic to many things and is on a strict elimination diet. I need to find a bread recipe that does not have any corn, soy, wheat, potato, milk, eggs, pea/tree nuts. Oats may also be an issue. If anyone has a suggestion, please email me at pharocb@aol.com with the subject Allergies so I can identify it quickly. Thank you for any suggestions. I’m so disappointed! Have just taken my second loaf using this recipe out of the bread maker in as many days and again it didn’t rise! I was sure the problem the first time was my yeast, so the second time I tested it first to make sure it was active. I’ve used exactly the right amounts of all the original ingredients (no substitutes). I’ve used my bread maker and put ingredients in the the right order and used the gluten-free setting (although I suspect that setting may not be giving the dough enough time to rise). I’m confused. What am I doing wrong? Thank you so much for sharing! I literally cried when I tasted this. My 4 yr old was just diagnosed with celiacs and so many other food intolerances. I had not found a yummy bread yet that could rise without gluten or eggs. This recipe is amazing. It is also helpful that it does not have rice flour, as my daughter is sensitive to this as well. Thank you so much for sharing. I am spreading this to our celiacs support group in Singapore. It is so kind of you to share. I think you could make money with this recipe if you wanted to. Maybe you could sell this to a gluten free cookbook author! Thank you so much!!! My son who is 2 has just been diagnosed with allergies to Milk, Egg, Peanuts, wheat and soy. The second batch I made today, rose beautiful, did not fall when it cooled, but it is still gummy in the middle?? We are in Canada, would this make a difference? What can I do to have it cook thouroughly??? I tried another batch today, decreased the oil 1 tsp, and the water by 1/2 cup. Cooked it for almost 2 hrs and it is still gummy in the middle. Is there anything I can do?? I have never had success in the bread maker. I put my pans in a very slightly warm oven and they rise beautifully, and it’s easy to clean up. I add 2 T. chia seeds to my recipe. You may want to try this. Chia seeds are not only nutritious, but they absorb liquid. This might help. What kind of pans are you using? You may want to try stoneware pans. They seem to heat more evenly. My regular glass loaf pans cook the outsides too much and the inside not enough. Great bread! 8 year old extremely picky daughter is on a new dairy-free, egg-free, soy-free, wheat-free diet. The only family loves this bread. Made in the breadmaker yesterday. She keeps popping a piece in the microwave for 10 seconds and having it as a snack. So grateful for this recipe! I want to thank you for this wonderful recipe! We have been enjoying this for two months now, and this morning I used it to make chocolate chip cookies! I made up the flour mixture, minus the sugar, yeast, and wet ingredients, then followed (an adapted version of) my mom’s old recipe! 2 3/4 c your amazing bread flour mix! Mix margarine, sugar, egg and vanilla thoroughly. Blend dry ingredients; stir in. Thank you for posting this recipe – it’s delicious! Unfortunately, I have just learned that my 6 year old son is also intolerant to yeast. Is there any way to make this recipe without yeast? Wondering the same thing as Tamara. I have not tried it with regular wheat bread yet so no clue if it would work with this either but I’ve read and been told a combination 0f lemon juice and baking soda added together and added last to the mix should be a good yeast substitute. Will be trying this soon with wheat flour and if it works I may brave it with this recipe. We still need to challenge yeast as we have seen none of the usual yeast allergen reactions but it did just from barely detectable to high with our oldest child’s new blood work.